Chiangmai Mail Publishing Co., Ltd.
1) What has eyes but can’t see? 2) What has legs but can’t walk? 3) What has hands and a face but can’t touch or smile? 4) What has teeth but no mouth? This week we have a number question from Vincent who is in Kindergarten at ISE. He made up this question all by himself. Can you count how many trucks are hidden in this picture? Write your answer in the box he has drawn. Mirjam Schmid came to Thailand three weeks ago from Stuttgart, Germany to start her job as a First Grade teacher at the Christian German School Chiang Mai (CDSC). 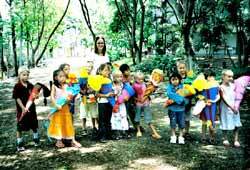 Before Mirjam had a chance to really explore Chiang Mai, she was already in the middle of a new class with 13 new first graders. She was still able to find time to answer some questions about first impressions. Q: What brought you to Thailand? Mirjam: I wanted to get to know the Asian culture, especially Thailand and therefore I was looking for a new challenge. Q: Is this new class different from your previous classes? Mirjam: My class is much smaller with 13 students compared to what I’m used to from Germany. Q: What do you like about the CDSC? Mirjam: I like that there are kids from Kindergarten to High School on the same compound and you can get to know everybody. I wanted to experience how it is to teach in a small school. Q: Where do you see a big difference from schools in Germany? Mirjam: Contact with the parents is definitely different. Here in Thailand it’s much closer than I’m used to. We are like a family. Q: How do you like Chiang Mai so far? Mirjam: Some things are exactly the way I imagined them to be, like for example the Rickshaws. But some things like the mall ‘Airport Plaza’, I find very surprising. I didn’t expect the variety that Chiang Mai has to offer. Q: Do you like the food? Mirjam: Yes, very much. And I enjoy all the little markets. Unfortunately I can’t always buy what I see because I don’t speak the language yet. Q: How long will you stay here? Mirjam: I’m not sure yet. I’ll see how it works out. Good luck Mirjam and a warm welcome to Chiang Mai! The holidays are over and many of the international schools have reopened for another year of hard studying. At the Christian German School Chiang Mai (CDSC) most students went right back into their routine. Not so the first graders, 13 children who started their first day in school with lots of excitement, anticipation, curiosity and maybe some butterflies in their stomach. The whole 1st grade with the new teacher. In case anybody has ever wondered how much time we all spend in school, the principal of the CDSC, Mr. Fred Hartman had the answer. We go through approximately 55,000 hours of school during a ten year period. Maybe better that this figure didn’t mean much to the first graders. The first day of school was celebrated at the CDSC last Monday in a very German tradition. Each First Grade student came with a “school cone”. School cones are usually made out of strong paper or carton and decorated with colorful drawings, pictures and ribbons on the outside. The content of the cones are a mixture of sweets, school supplies and other surprises which the children get to open during their first school day. This tradition dates back to Germany in 1810, when parents filled the cones with sweets in order to give the children an easier start into the tough school life. It took over 100 years until this tradition spread around Germany and went from the cities to all the smaller villages around the country. And nowadays, even the CDSC in Chiang Mai is holding on to those traditions. Hopefully there will still be so much enthusiasm at the end of the school year. What do students at the American Pacific International School (APIS) do when they’re not studying? Going white water rafting, what else! This past weekend, a group of APIS students went to the Chiang Dao region of Northern Thailand to white water raft on the Mae Tang River. This past weekend, a group of APIS students went to the Chiang Dao region of Northern Thailand to white water raft on the Mae Tang River. The all-English language instruction at APIS is enhanced by these weekend excursions in which English is spoken and new vocabulary, specific to the activity, is learned and practiced. The teachers who accompany the students on these weekend excursions find their reward when the students return to the classroom on Monday morning. The participants are refreshed, more creative, and the energy is high again throughout the week.